Recently, as part of SEMA week Motor Trend had what is probably the strangest drag race ever. 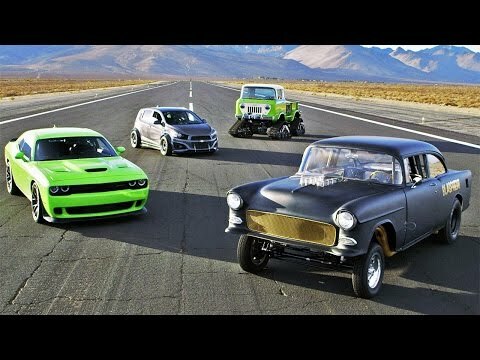 The race involve the 707 horsepower Dodge Challenger SRT Hellcat, a HEMI powered Chevy Bel Air Hotrod, a Jeep FC and a Chevy Sonic RS. The Jeep looks like it is ready for the snow or off roading, but on the road it doesn’t likely have a chance. The turbocharged Sonic RS is able to sip gasoline, but it may not be very fast. The SRT Hellcat and Hotrod are the most powerful of the vehicles. They are both powered by a HEMI and will both fly down a drag strip. So, which one will win this odd competition? Let us know what you think in the comments and then watch the video and see if you are correct. The Corvette Z06 is quite a car. It has plenty of power and can handle like a car that costs much more. It really is the best performance car value for the money. Starting at about $80,000 you get a 650 horsepower beast that can pass just about anything on the road. It is a great driver’s car and is a quantum leap from the C6 corvette. Of course it is on a race track that one can truly get sense of the power that the Z06 has to offer. It is such a fast Corvette that one has to wonder if it can be improved upon enough to make a ZR1. This video from Motor Trend feature a full performance review of the Corvette Z06. It shows just how fast it is and the best part is when it goes for a hot lap at Road Atlanta. It is hard to believe how fast the year has gone, but next week is already Monterey Car Week. The week long celebration of the automobile has many events for classic and new cars, all leading up to the Pebble Beach Concours d’Elegance. We will be there to share a glimpse of all the automotive excitement. This will include capturing new world debuts and historic classics. 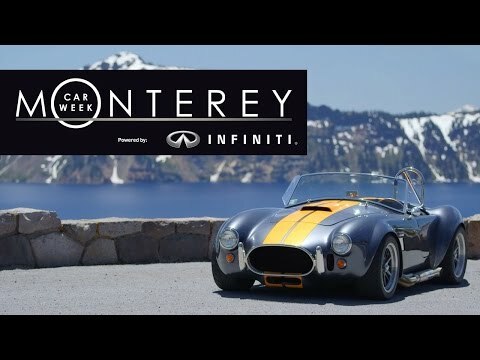 For Monterey Car Week, Motor Trend has a special week of videos planned. They will have all their most popular YouTube programs featuring classic cars. These include the early Porsche 911 Targa, Corvettes and many more. This video is a trailer of what you have to look forward to next week. So stay tuned as we will be sharing these videos with you starting next Monday. The Ferrari LaFerrari may be a hybrid, but it isn’t exactly “green”. The car named after the company that built it offers a combined 950 horsepower from the V12 engine and electric motors. Unlike the hybrids from McLaren and Porsche, this supercar has no intention of saving fuel. Where you can have the other cars sip fuel (especially with the 918 Spyder), in the Ferrari the V12 is always used. Instead of allowing the electric motors to be used for more economical driving, they are used simply to add more power. This then would appear to be a track only car (when not sitting in a garage). With so much power it must just be frustrating to drive it on a normal road. Well, Motor Trend decided to put it to the test. They drove the prancing horse on the track and on the roads around Ferraris headquarters. Is it possible that the LaFerrari is the best road car the company has every made? The Porsche 959 was so advanced when it came out in the mid-eighties that many of its technological advancements are used in many modern cars. From the advanced twin turbochargers and all-wheel drive (AWD) system to the tire pressure monitor, it was a glimpse into the future. Now the German performance car maker is once again giving us a look at what the future may hold. The Porsche 918 Spyder is an advanced plug-in hybrid that is very technologically advanced. Much of this technology will likely make its way to other automobiles and certainly other sports cars. It shows how a sports car can be designed for great fuel economy while not sacrificing performance. This video shows both the 959 and 918 Spyder. It has footage about how the two cars have the same DNA and talks about how they both may show (or showed) the future of the car well before it is reality. It also shows a lap of the 918 Spyder and even features a comparison with the McLaren P1.